On Thursday March 3, 2016, the World's First Sports Stock Market began operations in Los Angeles with a celebrity and media packed launch party at Lucky Strike Live in Hollywood. 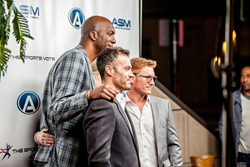 Zack Ward, "Scut Farkus" from A Christmas Story, hosted the event and was joined by celebrity guests Brian Austin Green, John Salley and Bernie Nicholls to name a few. At 11:00 P.M., the bell rang on real-money trading of all 30 Major League Baseball teams with real cash dividends paying out on the first game in less than a month. The Sports Vote began signature collection for the Sports Integrity Protection Amendment (SIPA) in California with many of the celebrities and guests showing their public support by signing the journal. NFL, NBA and NHL IPO launch parties are set for Fall 2016 with more details to follow soon.